I figured I'd post this since Thanksgiving is right around the corner and it's another great way to free up your oven. Heck, you could pretty much just have a row of crock pots and cook almost your entire Thanksgiving dinner in them! (See my Crock Pot Semi-Candied Sweet Potatoes for another idea.) 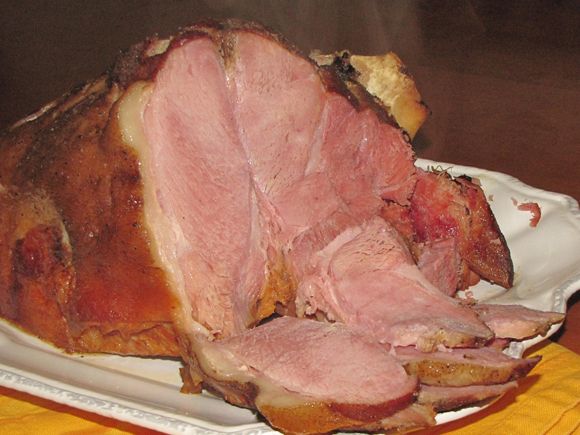 The best part about a ham in the crock pot is that you can just leave it to cook all by itself. You don't need to worry about basting it like you would in the oven because all that moisture is just floating around in there being all tasty. It's also pretty easy to adapt it to your desired result. If you want a slice-able ham, cook it for about 5 hours. If you're looking for more of a 'fall apart' consistency, let it go a couple hours longer. 1. Spray a large crock pot (6qt), with non-stick spray. 2. Mix brown sugar, pepper and pineapple juice together in a bowl to form a paste. 3. 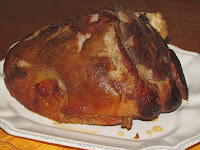 Rub a few tablespoons of the paste on the flat part of the ham and place it, flat side down, in the crock pot. 4. Rub the remaining sugar mixture over the rest of the ham. 5. Cover* and cook on low for 4 to 6 hours. *If your ham is too big for your crock pot, use foil as the lid. Secure and seal it tightly.